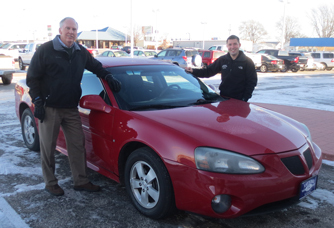 Randy Kuhlman, chief executive officer at the Fort Dodge Community Foundation and United Way, left, and Matt Johnson, stand by a car donated to the Wheels for Work program. Can you imagine being a parent with a very sick child and not having available transportation to take your child to Rochester or Iowa City to get the specialized health care he or she needs? Or, being a single parent with two or three children and having to walk more than a mile or two to work each day because you cannot afford a car? Unfortunately, this is reality for many families in our community. Not having a serviceable car makes the challenges of raising a young family extremely difficult. This is why the Fort Dodge Community Foundation and United Way is promoting our Wheels for Work program. In partnership with Fort Dodge Ford Toyota, the Wheels for Work program accepts donated vehicles and gives them to young families that are in desperate need of a car. Fort Dodge Ford Toyota assesses each donated car and services the vehicle to make sure that it is in safe, good running condition before it is given to a qualified family. A safe and reliable car is essential to the success of most working families. Child care, jobs, groceries, medical appointments and so many other everyday tasks are often out of reach for families without a car. Yet, buying, financing, insuring and maintaining a reliable car is not an option for some families. For most of us, transportation is something we take for granted, but for many disadvantaged families, it is luxury they can't afford. Providing an underprivileged family with a car is an act of kindness that can be life changing for a young mom with children. Whether it is getting to work each day, to the grocery store, or taking the kids to the doctor, having a reliable vehicle can make all the difference in the world. A high priority of the Fort Dodge Community Foundation and United Way is helping underprivileged children in our community and county and giving them a fighting chance to reach their full potential. Many of these children are being raised by single parents in homes that are at or close to the poverty level. These kids are often forced to go without some of life's basic necessities that most of us take for granted, including nutritious food, stable housing, appropriate clothing, reliable transportation and access to critical health care services. The Wheels for Work program is one way that the Fort Dodge Community Foundation and United Way is striving to help disadvantaged youth and their families become more stable and self-sufficient. Maybe you have an older vehicle you are thinking about selling or trading in on a newer car. Donating the vehicle might be something you should consider, especially if your trade-in value is low. The Internal Revenue Service allows you to receive an attractive tax deduction on the fair market value of your vehicle if you donate it to a qualified charity such as the Wheels for Work program with the Fort Dodge Community Foundation and United Way. If you have a vehicle that you would consider donating to the Wheels for Work program, the process is very simple. Take the vehicle to Fort Dodge Ford Toyota and visit with Matt Johnson about donating your car to the Wheels for Work program. Bring the title to the vehicle with you to Fort Dodge Ford Toyota. Upon the donation of your vehicle and the transfer of title, a letter acknowledging your donation will be provided to you by the Fort Dodge Community Foundation and United Way. You will also receive a receipt identifying the value of your donated car. This receipt will provide you with the documentation you will need for tax purposes. The tax deduction on your car donation will be based on the fair market value of your vehicle as determined by Fort Dodge Ford Toyota. Because each individual's tax situation is different, you should consult with your personal tax adviser regarding the tax benefits from your donation. For families in need, the receipt of a vehicle donation has a profound effect upon their outlook on life. When a donated car is given to these deserving people they seem to experience a rebirth of hope and self-esteem. Many individuals who have received donated vehicles have even expressed the feeling that they have been given a second chance at life. Few charitable donations can impact the quality of life of a disadvantaged family as immediately and dramatically as the gift of a reliable car. During this holiday season, a donation of a car could be the gift of a lifetime for a family in need. For more information on the Wheels for Work program and how to donate a vehicle in support of this program, please contact the Fort Dodge Community Foundation and United Way at 515.573.3179 or stop by our offices at 24 N 9th Street, Suite B, Fort Dodge, IA, 50501.